Today I went with Geert to Diepholz, Germany. 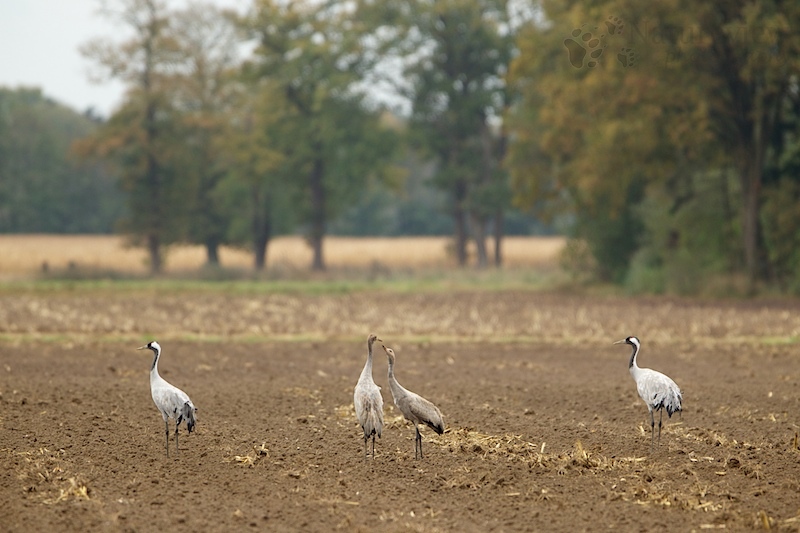 The farmlands and moors around this city are an important stopover site for Cranes on their migration between their breeding grounds in Scandinavia and their wintering grounds in southern Europe. Last week over 40.000 Cranes were counted and the numbers are increasing. They spent the night in the wet areas in the moors. Here they are protected against foxes. During the daytime they forage in the farmlands, feeding on the maize left behind on the land. We spent most of the day driving around, looking for groups of cranes that were not too far away. We found several large groups and a few family groups that were posing nicely for us. Here you see the two parents looking around, while the two youngsters play together.